The UK ? Japan? New Zealand ? Russia ? Egypt ? Change the sentences using the Passive Voice The Passive Voice The French built the Eiffel Tower over a hundred years ago. 2. We hope that in the 21st century people in lots of countries will study Russian. 3. I use the Internet for communication with my friends abroad. 4. She has just visited the Great Pyramids. She is very tired. 5. Most English – speaking countries celebrate this holiday. Цель: Повторить и систематизировать изученный лексический материал по теме. - воспитание положительного отношения к некоторым фактам культуры других стран, формирование потребности в коллективной работе. Оборудование: бейджики с флагами стран по количеству учащихся, оценочные листы в виде флага страны–участницы, оценочные жетоны, фотографии достопримечательностей стран–участниц, карточки с заданиями страноведческого характера, грамматические карточки по теме «Страдательный залог», физическая карта мира, мультимедийный проектор. - How do you do? Glad to see you, sit down. - What countries are going to participate in our program? P1: France, P2: Russia, etc. - You’re going to form 5 groups. All of you’ll have the badges with flags of different countries you are going to represent. Every group will also get a card where you can collect special medals for your answers. 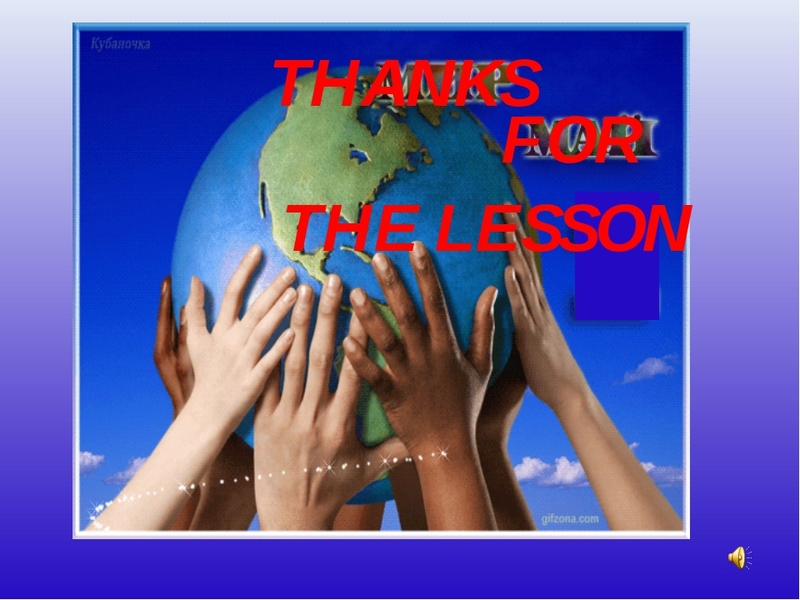 At the end of our lesson we’ll see the best group and the most active participant. - Please be active and attentive. So welcome to our TV Bridge. 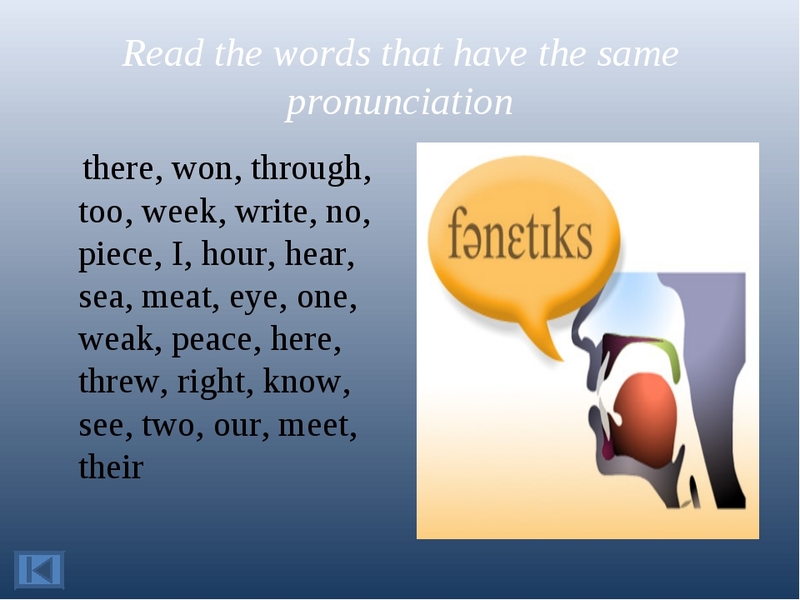 - The first task is to find and read the words which have the same pronunciation. Example: there – their; one –won, etc. - Well done. It was an exercise for your tongues. And now tell me please what your countries are famous for. You have photos of sightseeing and the names of the countries. Your task is to match them. You have one or may be two minutes. 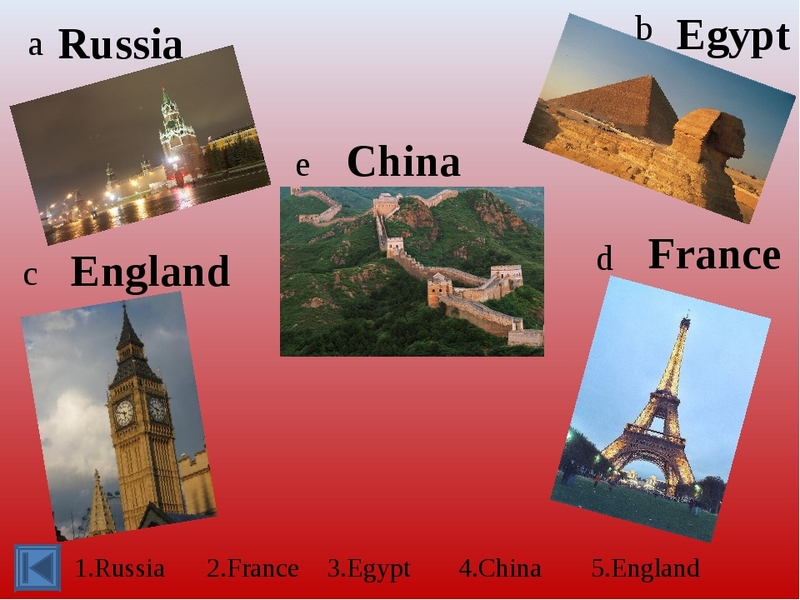 Keys: Russia – a; France – d; Egypt – b; China – e; England –c. T: What are these countries famous for? P1: Russia is famous for the Kremlin. P2: Egypt is famous for its Pyramids. Etc. - Good of you. And now look at the board and tell us where these children are from and what their nationality is. T: Is the boy from Egypt? Etc. P: Yes, he is. The boy is from Egypt. He is the Egyptian./No, he isn’t. He is from… He is … . -Very well. I suppose you are ready for the main part of our programme. All of you have cards with the task and some information. 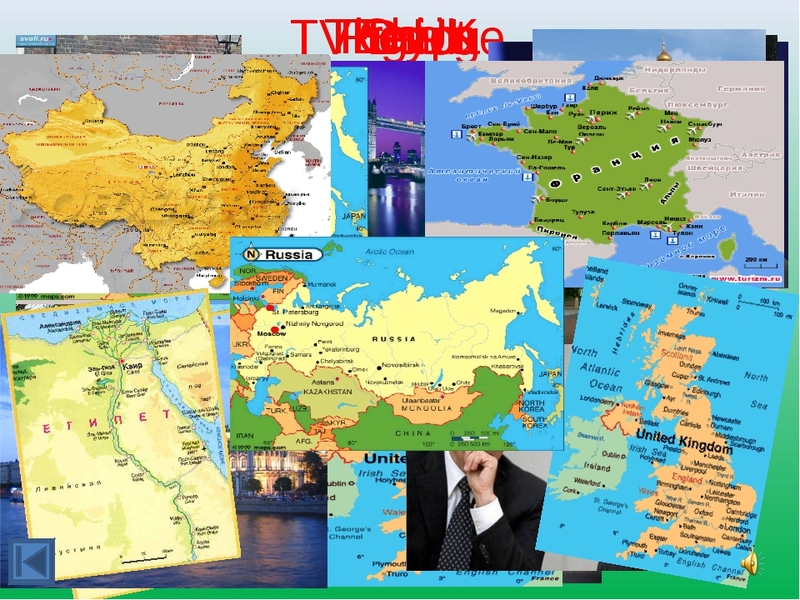 I’d like you to tell us about the country you represent, using the map and extra information from the cards that you see in front of you. Imagine that you are lying on warm yellow sand, over you there is quiet, pure, dark blue sky. In the sky the white bird is flying. You are rising and flying with it, because you are white birds too. You’re flying in the blue sky, under you there is the quiet dark blue sea. You can see the yellow sandy coast, it is closer and closer. You are flying up to the coast, going down on warm yellow sand, you are boys and girls again and you are lying down on your back. You are lying on warm yellow sand, over you there is the quiet dark blue sky, you are weakened, and you have a rest. Your head is clear and pure, three deep breaths, open your eyes. -I want to make sure you know English grammar. Will you translate my sentence from Russian into English using The Passive Voice? На английском говорят миллионы людей во всём мире. English is spoken by millions of people all over the world. - Good. You have cards in front of you. There are some tasks to be done. Will you read the task? Present, Past, Future Simple or Present Perfect Passive. English is spoken well by many people in Russia. The poem was written by G. Byron in 1817. Italian is spoken in Italy and on Malta. America was discovered long ago. They will be invited to a birthday party next Sunday. - OK. Look at the board. ( Слайд 8) There is more difficult exercise on it. 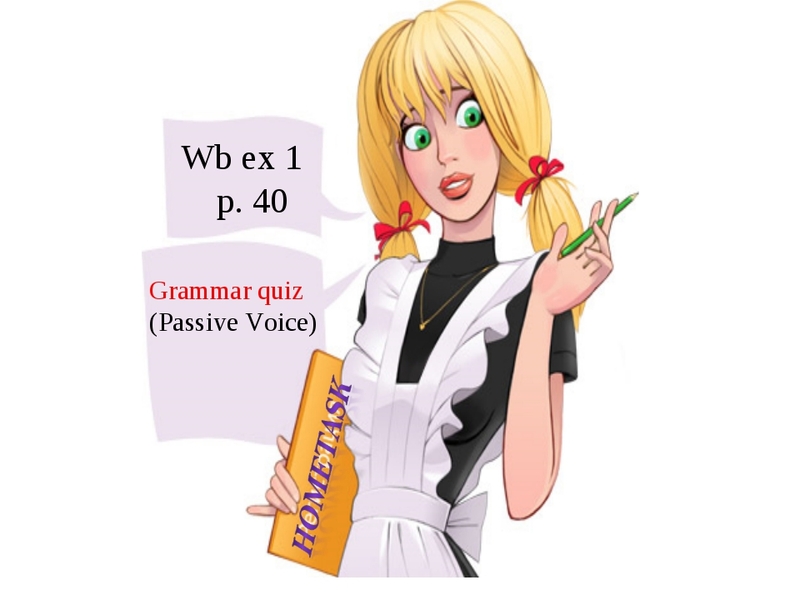 I want you to change the sentences from Active Voice into Passive Voice. Is everything clear? Then start working. P1 go to the blackboard, please. 1. The French built the Eiffel Tower over a hundred years ago. 2. 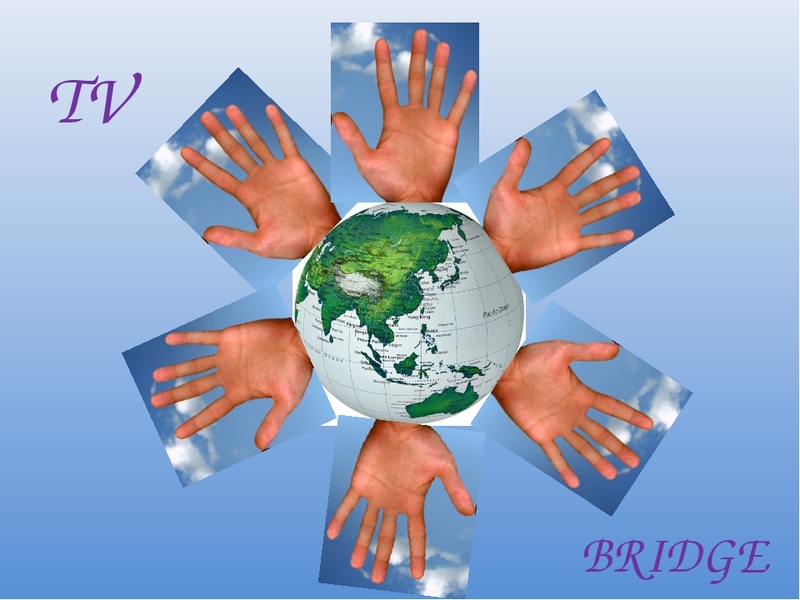 We hope that in the 21st century people in lots of countries will study Russian. 3. I use the Internet for communication with my friends abroad. 4. She has just visited the Great Pyramids. She is very tired. 5. Most English – speaking countries celebrate this holiday. - Thank you for the lesson. Did you enjoy it? 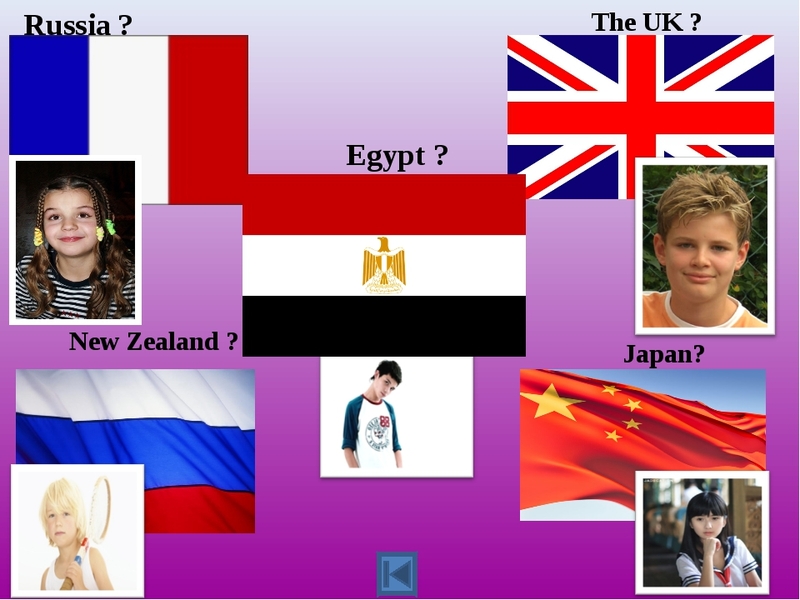 - What helped pupils from different countries to communicate so easily? - Is English important today? Why? 1. English is spoken well by many people in Russia. 2. The poem was written by G. Byron in 1817. 3. Italian is spoken in Italy and on Malta. 4. America was discovered long ago. 5. They will be invited to a birthday party next Sunday.